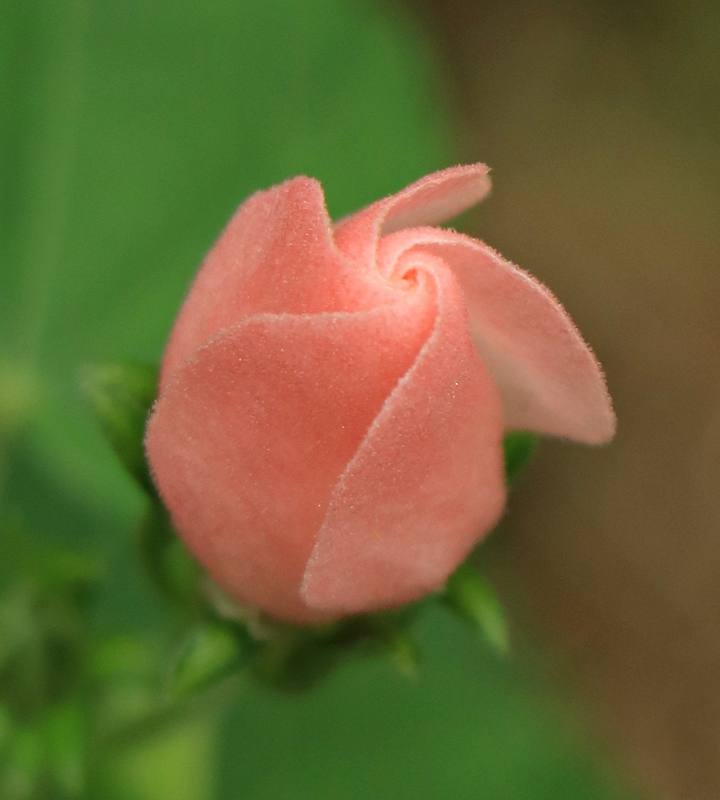 Because of its resemblance to a Turkish turban, this member of the mallow family usually is called Turk’s cap; some call it Drummond’s wax mallow, red mallow, Texas mallow, Mexican apple (it has an edible fruit), or sleeping hibiscus — a name no doubt occasioned by petals that normally remain closed, rather than fully opening. When it comes to climate and soils, it’s a very tough, versatile plant. It’s a native plant, and a magnet for butterflies and hummingbirds. It’s extremely drought-tolerant and will thrive in dry soils. It does very well in the shade but will take quite a bit of sun, so it’s a very versatile plant; something that is pretty well adapted all over the entire state. It’s an old garden plant — something that’s found in old-home sites and in old gardens. Of course, to paraphrase that famous line from The Wind in the Willows, there’s nothing half so much worth doing as simply messing about with plants. After some horticulturalists messed around with the Turk’s cap, a new variety was created. Greg Grant, formerly with AgriLife Research and now with Stephen F. Austin Gardens in Nacogdoches, Texas, was urged to develop the pink variety by Pam Puryear, one of the first women to graduate from Texas A&M University. Both Grant and Puryear were members of Texas Rose Rustlers, an organization dedicated to antique roses and gardening in general, when Puryear asked Grant to develop some new varieties of Turk’s cap. 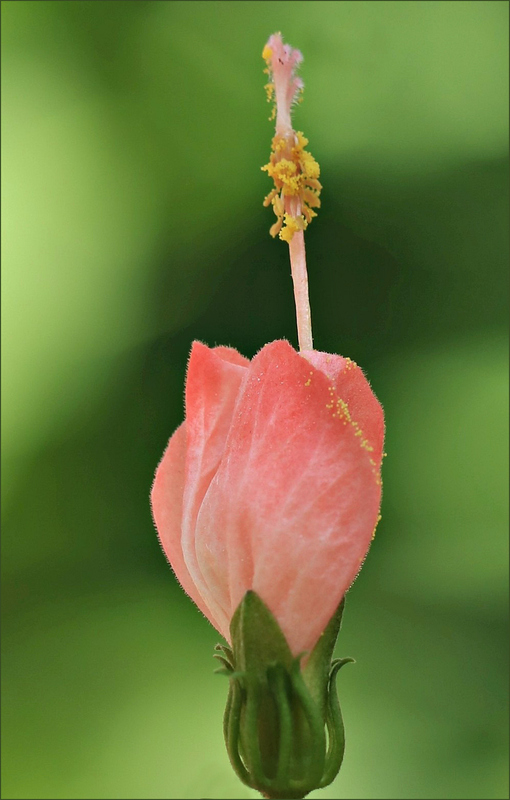 After first achieving a large hybrid plant he named ‘Big Mama’ because its flowers doubled the size of those on the native Turk’s cap, Grant crossed ‘Big Mama’ with a cold-hardy plant with white flowers, and among the variations that emerged was the peachy-pink version of our more common red flower. Today, the pink version surrounds the Raiford Stripling-designed house that anchors the Lady Bird Johnson demonstration garden at the Pineywoods Native Plant Center in Nacogdoches. Associated with Stephen F. Austin State University and located near the campus, the Center was dedicated on April 8, 2000, becoming the third affiliated garden of Austin’s Lady Bird Johnson Wildflower Research Center. Both Lady Bird and Dr. Robert Breunig, director of the Center at the time, attended the event. Of course, nature enjoys messing about with flowers, too. Outside Nacogdoches, at the edge of thickly-forested land along Bonaldo Creek, I found a treat for my white-flower-loving heart. A number of white varieties have been bred, but this was no nursery plant. It was nature at her finest, producing her own variation on the beloved traditional flower we know as Turk’s cap. It was a happy find. If the rain hadn’t stopped long enough for a little hike, I never would have seen it. I never thought about telling anyone about it — except, now I have. I was surprised to see so many Turks’ caps in the woods. I’d always associated them with sunnier conditions, but they seemed perfectly happy. There were red ones, too. Spring is the time to plant them, and it won’t be hard at all to find you some starts of the native variety. I got one last year from a native plant society member. After it was well-established, it went to live with a friend in Dickinson, and thrived. This isn’t one of our native plants, so I’m delighted to learn about it, Linda. I’m not sure why, but I think I prefer the pink and white varieties to the red. Perhaps it’s because the “Turk’s cap” looks bigger on them! Does it have a scent? The size is nearly the same on all of them, Debbie. The apparent difference probably is due to my distance from the flowers when I took the photos, and the cropping I did of the images. I’d say all three flowers were about 1-1/2″ long, but as I remember it, the pink ones generally were larger. I’ve never been aware of any fragrance when I’m around Turk’s cap. Maybe when you’re such a bright and distinctive flower, you don’t have to depend on fragrance to attract pollinators! By the way — you do have a Turk’s cap in your state, but it’s a beautiful lily. When I read about it, I noticed that it doesn’t have any scent, either. I’ve seen those lilies, but I don’t particularly like them. Not like yours anyway! I suppose that speckled flower is the reason. Of course, I’m not a big lily fan anyway, except in church on Easter Sunday. Thank you, Linda, for providing “the rest of the story”! Mother Nature I think is capable of anything – if we’d only give her a chance! But I have to admit my favorite is the peachy colored one. That peachy-pink is a pretty color, isn’t it? If you like it well enough, you could grow it. Turk’s cap may or may not be native to your state (I’ve read both) but it certainly has naturalized there. It’s one of those plants that’s easy to grow, and the hummingbirds and hummingbird moths really like it. Thanks for that info. I’ve haven’t seen a hummingbird since I’ve lived here, but the plant would great! All I can say is hooray for a natural white. And I’ll second that hooray. My little collection of white floral oddities is growing; I’m up to at least five now, and maybe six. I need to sort through my files and gather them up in one place. Nearly four hundred years down the road, the truth still applies — nicely done! Lovely plant, natural and ‘unnatural’ versions of it! It’s funny — when I was a kid, we always thought of ‘mutants’ as monsters of some sort. Now, when I find a mutation like the white Turk’s cap, I’m delighted as can be. I enjoy many of the fancy cultivated flowers, but I confess that I still favor the natives. On the other hand, the same techniques that are used to create new garden plants also are used to help with the recovery of threatened species. It’s all very interesting. You would enjoy the sight of the hummingbirds at one of our nature centers. They’ve placed hummingbird feeders on poles in the middle of quite a large patch of native Turk’s cap, and the birds love it. I’ve watched a few move from feeder to flower and back again — hummingbird heaven. While the Brazoria, Texas is very beautiful, the South Eastern Australian wild flower , ‘the Waratah’ is just as beautiful. Perhaps all native flowers are considered the most beautiful by the locals. I am torn between the Dutch tulip and the Waratah. Usually, my favorite flower’s the one I’m looking at, but I have some fond memories of northern flowers, so I understand being torn between your Dutch and Australian beauties. They’re both a part of your life, just like your various patio flowers. Thank goodness we have variety, and can enjoy them all. I like the “drummondii ‘Lagniappe” better than either the red or the pink. It’s pretty, isn’t it? Most of the white cultivars that have been developed are larger, and in the photos I’ve seen they droop down because of their weight.This one, just a natural variation with all the proportions of our native, is perfectly lovely. I doubt that it’s possible to improve on nature’s designs and their natural variations. The more I see, the more I agree. Would you believe we have that red variety here in the Botanic Gardens, Linda. I’ve only ever seen plants growing in deep shade and it’s not the easiest flower to photograph either. You did very well to capture that lovely swirl. I didn’t know it came in the white and peach coloured varieties. The are some other cultivars in white and pink that differ in size and form; they’re larger, and pendulous. I’m happy for the gardeners that so many varieties are available, but I’m still fondest of the native species — and the oddities they produce from time to time. It’s great that you have it there. It really is a beautiful plant, especially when it’s covered with those bright red flowers. What a shot it would be if you ever found one of those red parrots of yours lurking near one of those shrubs. My duplex neighbor has several of these bushes along her front walk, and they do attract the hummingbirds. I’ve been thinking about getting some for my side as well. They are a lovely plant. They’re lovely, and (depending on the source you’re consulting) tough, rugged, adaptable, and easy-going. In short, this is no fussy little plant that’s going to have to be babied, although I suspect a little drink of water would be appreciated now and then during your summers. I was relieved to see that Vicki has noticed them in Melbourne, as I was sure I’d seen them many long years ago in old gardens around Adelaide, and old country rambling gardens. As far as I’m concerned, bigger isn’t necessarily better. I like letting some things be. I do like the hybrid’s color, and it makes sense to me that it would be added to demonstration gardens: especially one being overseen by the very person who brought it into being. But what the plant breeders have done to sunflowers and coneflowers and who knows how many other species can be a little overwrought. Quite apart from their appearance, I’ve read that the nutritional value of many popular garden flowers has been reduced by overbreeding. Better to stick with the natives, and keep the pollinators happy. I wondered if anyone would spot my name for the sport — and you did. At present, South Australia is GM free, which I believe is a good thing, but there are moves afoot to overturn it. Heaven help us if it does happen. I remember when PVR(plant variety rights) came in, but GM is a whole other ball game. Can’t put the genie back in the bottle once it’s out…. This isn’t directly related, but I thought of you when I read that one characteristic of the Turk’s cap is a natural resistance to Roundup. There weren’t many details offered — I suspect “resistant” doesn’t mean impervious — but it was interesting. I suspect you got your Turk’s cap compliments of the birds. The fruit attracts wrens, cardinals, mockingbirds, and other birds, so it makes sense that some seeds might have been dropped into your territory. I have a nice photo of a fruit from the plants at Armand Bayou, but I can’t find it right now. The fruits are red, too, and about the size of a very small cherry tomato. The plants self-seed, and it sounds like they’re in a perfect location, so they should spread nicely for you. I’m glad to hear the milkweed’s doing well. The last time I was down at Brazoria there was a good bit of green milkweed starting to bloom. It seemed late to me, but I was glad to see it. I’m sure the rains encouraged it. “Drummonds Wax Mallow” sounds like one of those old British candies that only my grandmother liked, liked liquorice allsorts. “Turk’s Cap” is a great name. And I really like that pinwheel effect, it’s a beautiful flower, have you tried eating the fruit? Hey! A little respect for those licorice Allsorts! I haven’t had them for ages, but I always liked them. I see they still can be purchased from various vendors, but they aren’t sold in California because they would have to come with this warning: “Black licorice products contain a chemical [glycyrrhizin acid] known to the State of California to cause cancer and birth defects or reproductive harm.” I was a little sceptical, so I went looking, and sure enough: four Twizzlers a day for two weeks could elevate a person’s blood pressure or cause heart problems. So — back to the Turk’s cap. It is a good, descriptive name, and that pinwheel effect is delightful. I haven’t tried eating the fruit, although it’s said to taste like a sweet apple. In fact, the leaves, fruit, and flowers are edible, and the flowers are said to brew up into a very nice tea. With all of those advantages for humans as well as for birds and butterflies, it’s quite a valuable plant. It seems like a really neat plant, it’s great when something’s edible, and also highly decorative. I’ve been drinking less coffee, and trying a lot more teas the past couple years, and it’s almost a hobby at this point. I do have a warm feeling toward the Allsorts, even if I don’t eat them myself, because I associate them with my grandmother, along with horehound, teaberry, sassafras, etc. she had a big herb garden and also gathered all kinds of stuff. Europeans, and Scandinavians especially, seem to be mad for licorice, fennel, anise. In Norway, they use it for ice cream, cake, waffles, booze (aquavit), even fish, and they eat the candy heavily salted. If only there were a yellow variety. Then, you could have relaxed with a mellow yellow mallow. Very nice images! I first saw Turk’s cap in Florida. It’s a sub-tropical plant. 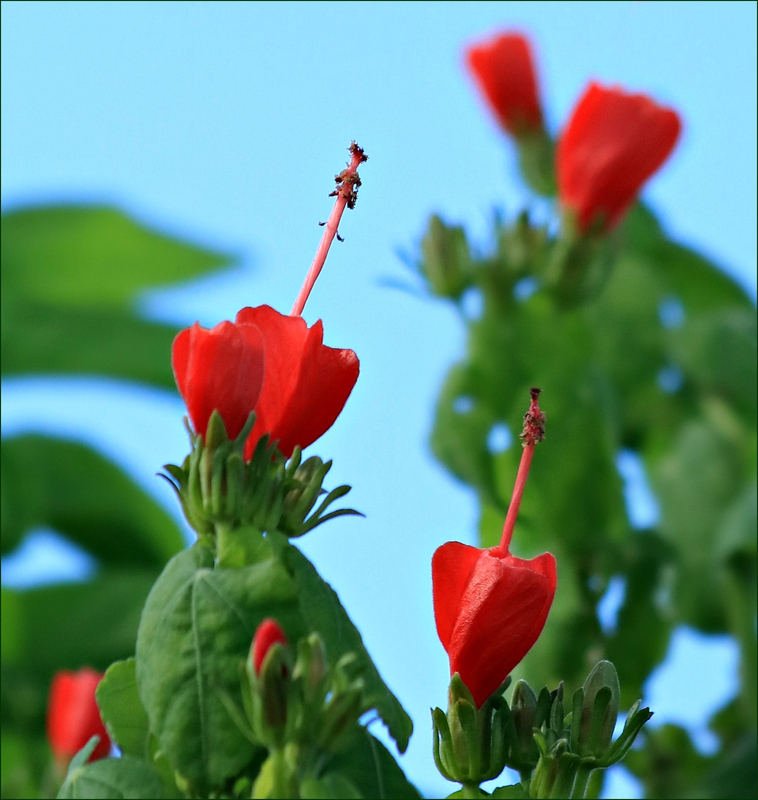 Florida’s climate only reaches up to zone 10B (even in the Keys) which is why Turk’s cap love it. Turk’s cap loves zones 8-11 because they are not tropical and not as drought tolerant as Hibiscus, which explains why they thrive even better here. Hibiscus are not abundant in Florida at all. Hibiscus are only abundant in the tropics. I see that your native ‘drummondii’ has an upright habit, while some of the other ones are more pendulous. This could explain why the ones I first found in FL were not ‘drummondii’, but the ‘arboreus’ ones, which are said to be endemic to Mexico and Central America. Supposedly the ‘arboreus’ and ‘mexicanus’ have larger flowers and are more pendulous. There are several varieties and most are said to have originated from the ‘arboreus’ type. I like their spiraled shape and the popular ‘sleeping hibiscus’ name (which I found out about much later on), since they never do open for humans, but for other critters they of course do. We’re in zone 9b, and hibiscus are plentiful, but necessarily pampered during the colder months. There’s a beautiful red one near me that’s such an enthusiastic grower it’s been cut back to the ground a couple of times, but it always comes back. In fact, I once used some of its flowers for a Christmas holiday table. Being on the south side and close to a building certainly helps it. As I recall, the path to the Pam Puryear variety began with a cross of our native with M. arboreus. 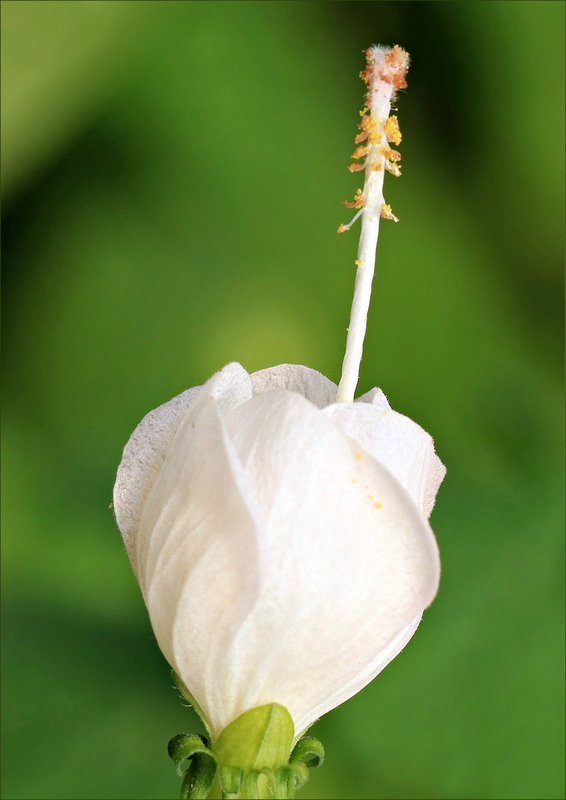 That produced a larger flower, which was reduced in size through additional crosses. To my eye, the larger, pendulous Turk’s caps aren’t nearly so attractive. They look rather like hibiscus that are in the process of wilting — at least, in their photos. I do enjoy the cleverness of the plant’s staminal column. If you’re not going to open up, you have to give the pollinators a chance one way or another, and that protruding column does the trick. One thing I didn’t realize until I took these photos is that the column itself is slightly twisted, like the birthday candles you can buy in the grocery store baking aisle. You can see a bit of the twist here, near the bottom. It’s amazing you were able to notice that detail about the plant’s twisted stamina column. It’s so funny to think of it as an exclusive stairway for the pollinator’s entrance. I used to think ants pollinated those flowers, but after reading the article I learned the flowers have tricks that they use to expose the pollen for other pollinators too. I’ve been trying to find an article I read about a flower that has a little ‘trigger’ mechanism that throws pollen onto the bees and other pollinators. I think it was a Physostegia, and may have been fall obedient plant, but I’ve not been able to find the article. In any event, all of these mechanisms are fascinating — thanks for the link and the new phrase for my vocabulary! I love white flowers of all sorts — those that come by their color naturally, and those are are mutants. It’s interesting that pink, red, and blue flowers seem to throw white blooms, while yellow and orange don’t — at least, I haven’t seen any. Of course, there’s no predicting what nature will do! I love finding nature’s little ‘variations’. The Turk’s cap is a favorite around here, and it pops up along fencelines and in vacant lots as often as it’s seen in gardens. It certainly is a sturdy thing, and will spread beautifully, as it has for you. Your butterfly garden sounds lovely. You certainly have some of the best butterfly plants. Every time I come across blue mist in the wild, there are butterflies around. The Gulf fritillary seems to favor it, but I’ve seen queen and monarch butterflies on them, too. The monarchs seem to have moved through here now, although there still are a few stragglers — and a few caterpillars around, too.